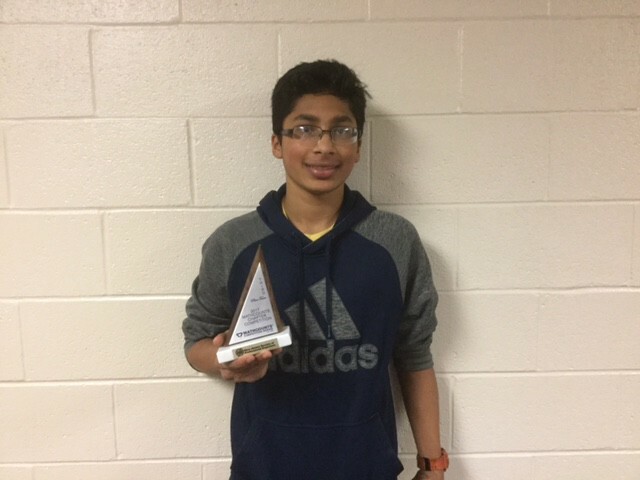 Eighth grader Dhairya Desai won first place individually in the South Jersey MATHCOUNTS Chapter Competition. Voorhees Middle School student Dhairya Desai won first place individually at the South Jersey MATHCOUNTS Chapter Competition held at Rowan University on Saturday, Jan. 28. The win advances the eighth grader to the state competition at Rutgers University on March 11, where he will compete against schools and individuals from around the state. “He’s extremely dedicated, and math is definitely a passion of his; we’re so thrilled of his achievement,” said Lauren Salls, algebra teacher at Voorhees Middle School. In addition, 19 schools from six counties participated in the team competition, and Voorhees Middle School came in third place. The team consisted of Dhairya, Vikram Meyyappan, Caleb Heller and Ethan Kogan. It’s been quite a year for Dhairya. In November, he came in second place and scored within the top 5 percent nationally in the Mathematical Association of America’s American Mathematics Competitions 8. Dhairya said he’s loved math since first grade because of the challenges the subject presents and all the techniques you can use to solve problems. He’s also independently taking an online geometry course. Dhairya and these students are part of the Math Club at Voorhees Middle School, where they work on critical thinking skills, testing strategies and problem solving strategies. About 20 to 25 students participate and meet once a week under the guidance of advisor Tatiana Ter-Saakov. Students from Eastern Regional High School who are strong in math also come to Math Club to help the students and challenge them more. These skills not only help the students in the classroom, but prepare them for these competitions. Dhairya said it’s all about practice. Ter-Saakov was brought to tears by Dhairya’s win. She said his classmates have the same motivation, work extremely well together, and the future looks bright for these students.